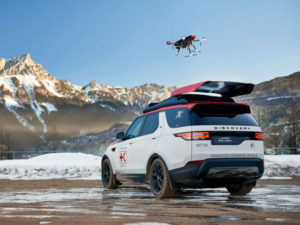 Jaguar Land Rover Special Vehicle Operations has created a bespoke Land Rover Discovery for the Austrian Red Cross, including its own search and rescue drone. The roof-mounted drone can take off and land even when the vehicle is in motion. Forming the latest project in a 63-year global relationship between Land Rover and the Red Cross, the ‘Project Hero’ version is intended to help the charity save lives by speeding up response times to disasters. Unveiled at the Geneva Motor Show, the roof-mounted drone can take off and land on the Discovery, even when the vehicle is in motion, thanks to the use of a fully integrated landing system with self-centring and magnetic retention technology. Using the drone, the Red Cross’s emergency response teams can receive live footage of an emergency scene, helping them respond more quickly and effectively. Based on the 3.0-litre TD6 version of the new Land Rover Discovery, the bespoke model also brings a heavy-duty sliding floor in the rear load space, which may be deployed as an addition work surface, or to protect the load carried underneath. It also features a segregation panel behind the rear seats providing additional equipment mounting points, LED lighting to aid night vision, and power supply points which accept multiple plug arrangements from different regions. The Project Hero vehicle is also equipped with multiple frequency radio equipment enabling contact to be made in a variety of situations.